Marshmallow creme sweetens a blend of cream cheese, melted chocolate and whipped topping for an elegant and luscious chilled dessert. Microwave chocolate on HIGH 45 seconds to 1 minute or until chocolate is completely melted when stirred. Cool slightly. Beat cream cheese and vanilla in large bowl with electric mixer on medium speed until well blended. Add chocolate and marshmallow creme; beat until well blended. Gently stir in 2 cups of the whipped topping. Pipe evenly into 6 individual dessert dishes or spoon into serving bowl. Top with the remaining 1/2 cup whipped topping. Refrigerate several hours or until chilled. 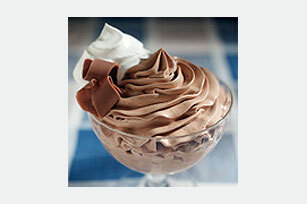 Enjoy rich chocolate flavor in a serving of this delicious mousse. Garnish each serving with a small chocolate curl.